Thai massage open practice fell into my lap over a year ago. Someone started the event in their home as an offshoot of the acroyoga community here in Austin and the first night I wandered in I was asked to teach a short sequence. Now, a year later, when new people wander in I can watch a regular teach someone new a similar short sequence and smile. Currently our community on facebook has 260 members. You can join to get regular updates about our events. 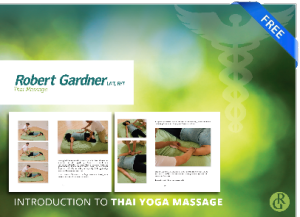 To my knowledge we’re the largest organic Thai massage community in the United States. We’re not affiliated with any particular teacher or lineage and we’ve taken Texas independence seriously. From the beginning I decided to lay no ownership over the group and to allow it to create its own community that’s self policing. Our numbers have grown and thanks to the help of Casa de Luz we’ve had a constant space to operate in this past year. People who come are nearly religious about their zeal for what we’re doing here in Austin, Texas. I laugh when I ask someone how they found out and they announce that a friend of a friend mentioned it to them. In Austin, laid back and organic has shaped how we do things, including one of the most innovative Thai massage communities in the U.S.